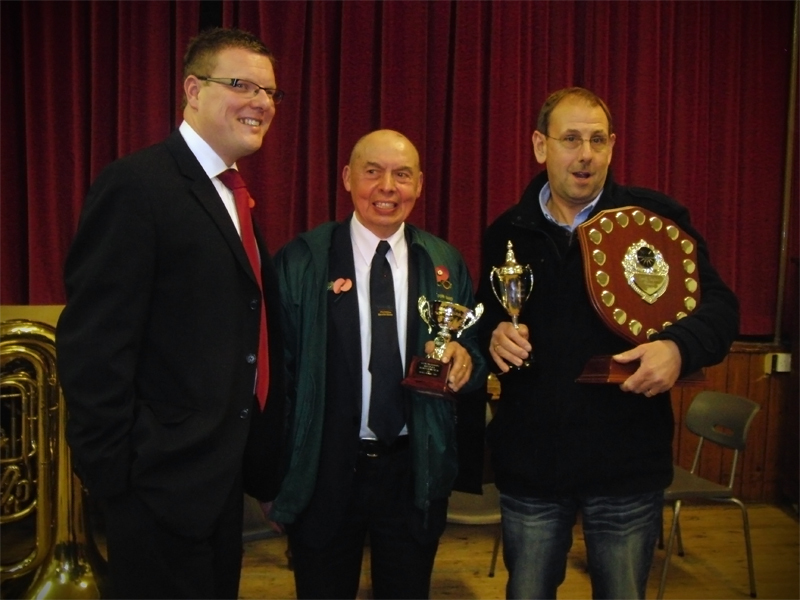 The seventh annual Skelmanthorpe Brass Band Community Slow Melody & Ensemble Contest took place on 10 November 2012 with over 60 entries representing 22 different bands from all over the North of England and the Midlands. The event had a “Black Dyke” connection this year, with Principal Cornet, Richard Marshall thoroughly enjoying his day as adjudicator, and Tenor Horn player, Jonny Bates keeping everything under control as compère. The open solo award was won by Glenn Birks (Shirebrook Unison Welfare) with a fabulous rendition of “Rusalka’s Song to the Moon”. Glenn was making his debut at the competition, and made it a “double” by also winning the Veterans Section. There were other “double” winners, with local trombonist Hannah Stell (Skelmanthorpe B) taking the honours in the 14 & under and 16 & under sections, and Georgia Stones (Jayess Newbiggin) winning the 11 & under before joining her sister, Michelle to win the Junior Ensemble. The standard of playing throughout the day was excellent, no more so than in the Senior Ensemble, where Stephen Lomas and Daniel Brooks (Leyland Band) successfully defended their title with a breathtaking performance of Schnyder’s “Duo Concertante”. The infamous “Random” section concluded with Richard Marshall playing the National Anthem on a piece of adapted hose pipe. We are reliably informed this will appear on his next solo C.D. Skelmanthorpe percussionist Neil Keer was drafted in to cover a late withdrawal in this section and played badly enough on the non-functional clarinet to take the final award of the day. Prior to the results, it was announced that this was to be the final Slow Melody appearance of Eb Bass player, Jim Tew. Jim (now aged 70) began playing Slow Melodies at the age of 12 and has supported them ever since, being a source of support, advice and encouragement for all the young players who have entered these competitions. A new award was also presented this year for the Outstanding Musical Performance of the Day. Richard said he felt that there were four performances across the day which could have taken this award, however it fell to the performance which “came from the musical heart” – the Eb Bass in the Open Section playing “The Iceberg”. Jim Tew. A fitting finale for one of the finest gentlemen you will meet in the Brass Band movement. As Richard said – “we will miss you”.